The Chinese couple that real estate agent Amy Sung began working with in September initially thought they wanted a property between $1.2 million and $1.6 million. But after touring communities with Sung around Stanford University — where the couple is looking to buy — they adjusted their price range: They’re now eyeing listings that cost between $2.2 million and $2.6 million. If Sung closes a deal with the couple, she’ll owe a hat tip to her broker, Pacific Union International. 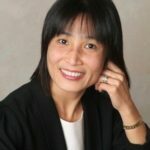 The San Francisco-based firm connected the pair with Sung in the first place, after reeling them in through its Mandarin-language website. Brokers like Pacific Union are devising strategies to target high-flying Chinese nationals. 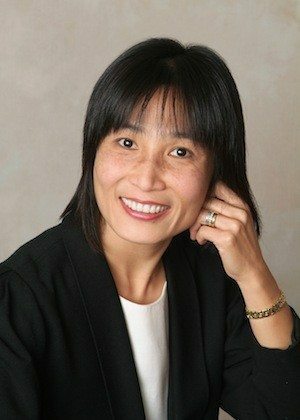 Pacific Union uses tactics such as offering up concierge services, serving up its listings on Chinese-language websites, networking at events for the country’s silver spooners, communicating through popular Chinese social networks, and using targeted advertising. 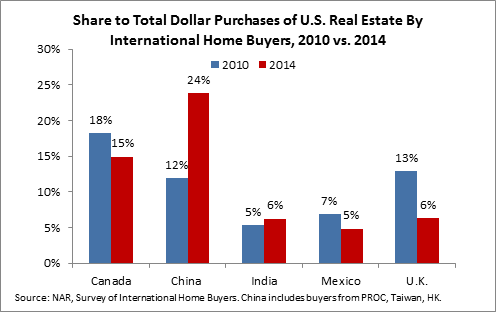 Such efforts help real estate firms tap a source of foreign demand that’s exploding. 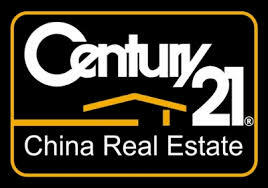 Chinese buyers have leapfrogged Canadians in recent years to become the biggest foreign spenders on U.S. real estate, purchasing $22 billion worth for the 12-month period ending March 2014, according to the National Association of Realtors. That’s up more than 70 percent from the year before. Here’s Pacific Union’s playbook for winning Chinese homebuyers. Pacific Union sponsored a dinner honoring the 100 richest people in China in October 2013. Hurun Report, a media events company that caters to high net worth individuals, hosted the event. Later that year, Pacific Union CEO Mark McLaughlin attended a party hosted by the then-U.S. ambassador to China, Gary Locke, where he schmoozed with a pack of real estate moguls. “The way I got the invitation to the U.S. embassy was because of the dinner I attended in Beijing,” McLaughlin said. Both events helped Pacific Union secure valuable contacts and glean insights that laid some of the groundwork for its China program. Pacific Union also participates in local speaking engagements to plug itself into networks that touch Chinese buyers. They include events associated with China SF, the U.S.-China Business Association, Bay Area Council and the San Francisco Chamber of Commerce. The brokerage sponsored Christie’s Asian Art Week this September, allowing some of its representatives to mingle with high net worth attendees. Pacific Union is an exclusive partner of Christie’s International Real Estate, the real estate arm of global auction firm Christie’s. Chinese nationals working with Pacific Union receive a wide array of customized services to help them both weigh and manage a transaction. 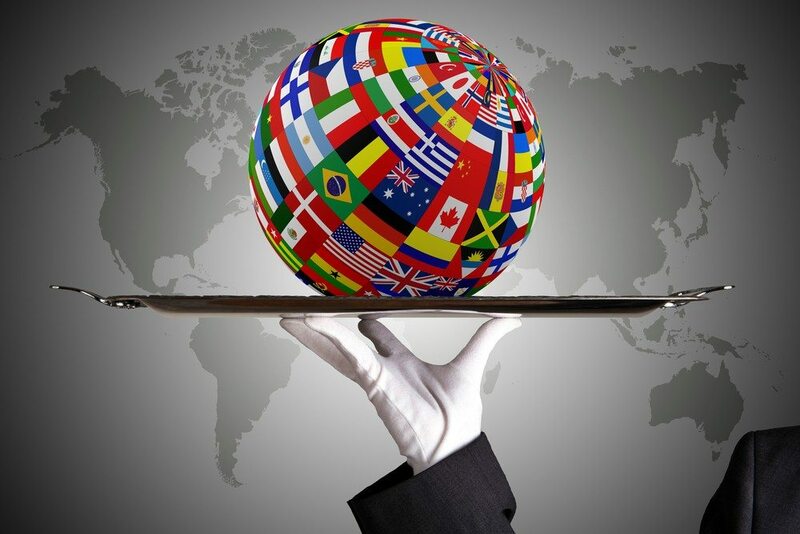 The brokerage serves up a suite of bilingual “concierge services,” including mortgage, property management and home insurance services, along with access to education and health care advisers and an immigration attorney who can help buyers acquire EB-5 visas. EB-5 visas offer permanent residency to foreigners in exchange for an investment of at least $1 million that creates or preserves a minimum of 10 jobs. Investing in real estate projects has become a popular way for foreigners to acquire the visas. A full-time employee stationed in Beijing runs Pacific Union’s China concierge desk, routing leads to U.S.-based Pacific Union agents and helping agents communicate with them. Pacific Union has launched a Mandarin-language website with a Chinese URL, the source of Sung’s lead. 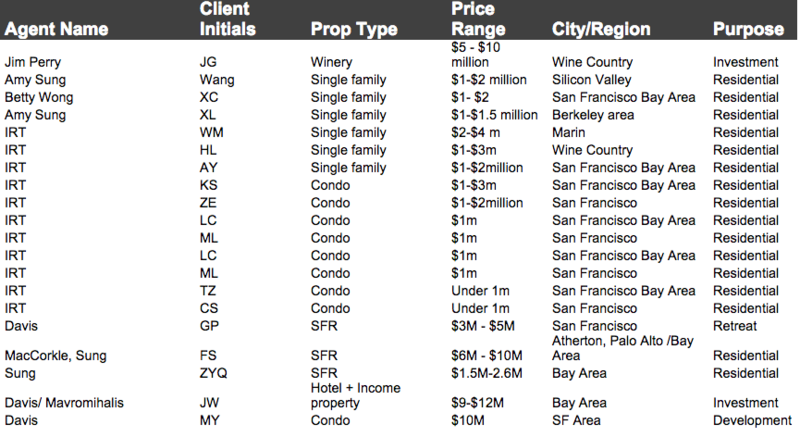 Since its debut about two months ago, it has generated 20 leads for the brokerage, most of whom are hunting for properties listed at over $1 million, according to McLaughlin. Pacific Union also syndicates its listings to SouFun, operator of Fang.com, China’s dominant listing search portal, and PropGOLuxury, which powers the real estate search tool of The Wall Street Journal. That puts Pacific Union’s listings in front of Chinese buyers searching properties on the Mandarin-language version of The Wall Street Journal’s online Asia edition. Pacific Union receives reports showing the average number of views of its listings by market on The Wall Street Journal’s online Asia edition, allowing the broker to tell its seller clients how much interest their listings are receiving from Chinese buyers. Chinese are even crazier about social media than Americans, according to a 2012 survey by the consulting firm McKinsey and Company. Pacific Union “redeploys” its U.S. social media content through video site Youku, messaging app WeChat and microblogging site Weibo in order to tap into those marketing channels. 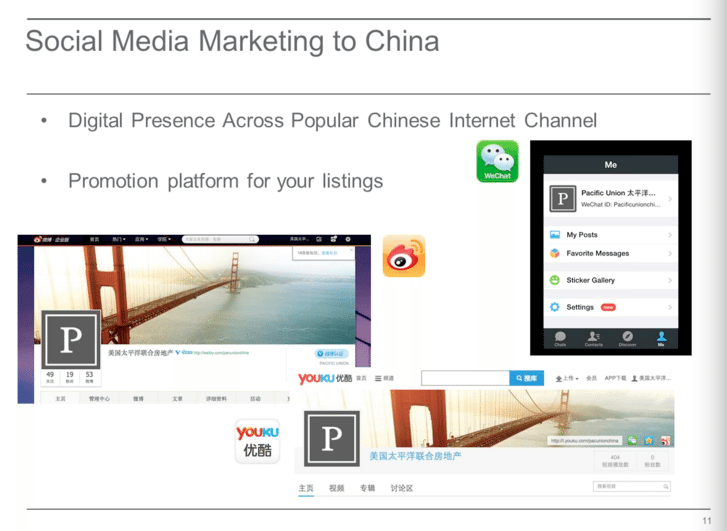 A slide from a webinar Mark McLaughlin gave on Pacific Union’s strategy for targeting Chinese buyers. Sung says she initially corresponded with the Chinese couple looking for properties near Stanford University through email, but now communicates “24/7” on WeChat with them. Chinese buyers on the brokerage’s radar receive monthly email newsletters featuring properties, development opportunities and news associated with its China program. 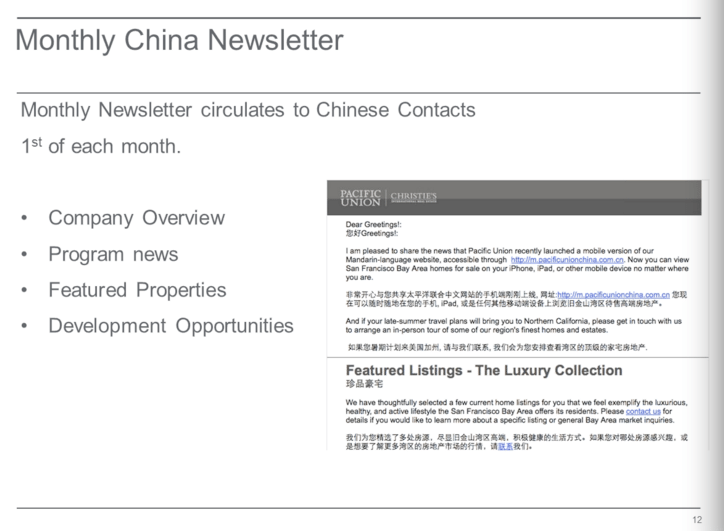 A presentation slide shows Pacific Union’s email newsletter to Chinese contacts. The Hurun Report, a luxury publication that organizes events targeting high net worth individuals, represents one of the most potent advertising opportunities for brokerages looking to attract wealthy Chinese buyers. McLaughlin said Pacific Union’s concierge desk could be the subject of a Hurun Report article this fall. To strike when the iron might be hot, Pacific Union took out ads that ran every weekday for six weeks last year in the Chinese-language newspaper Sing Tao Daily, which is distributed to all of San Francisco’s major hotels (where Chinese buyers might be staying during business trips).